Protected by some 36,000 troops especially deployed to counter attacks by jihadist terrorists and other militants that had disrupted voting at 644 polling places (out of 23,041) during the first round just two weeks ago, millions of Malians went to the polls Sunday to vote in the presidential runoff between the incumbent head of state, Ibrahim Boubacar Keïta, commonly known by his initials "IBK," and Soumaïla Cissé, a former finance minister. It may be day or two before results are announced, but IBK, who received 41.42 percent of the votes cast in the first round, is expected to trounce his challenger, who garnered only 17.8 percent. Having failed to unite the other twenty-two opposition candidates behind his bid to unseat the incumbent after the Constitutional Court last week rejected challenges to first-round results and confirmed the runoff, Cissé--whose two previous campaigns for the presidency both ended in defeat--had an uphill fight: businessman Aliou Diallo and former Prime Minister Cheick Modibo Diarra, who finished third and fourth respectively in the July 29 poll with 7.95 and 7.46 percent of the vote, both decided to remain neutral in the runoff, while several of the other defeated candidates--including Housseini Amion Guindo and Modibo Koné, who came in fifth and seventh, respectively, as well as the only female candidate in the race, Kanté Djénèba N'Diaye--urged their supporters to support IBK. And while their candidates abstained from taking sides in the runoff, Cheick Keïta (no relation to IBK), head of the youth wing of Aliou Diallo's Alliance Démocratique pour la Paix-Maliba, and his counterpart in former Prime Minister Modibo Sidibé's Forces Alternatives pour le Renouveau et l'Emergence, Amadou Cissé, both called upon their members to vote for the incumbent, as did Arouna Traoré, youth leader of Modibo Koné's Mouvement Mali Kanu. These endorsements are especially significant given that more than 60 percent of Malians are under the age of 25 and for many of them this is the first presidential election. The real threat of violence--three members of a terrorist unit allegedly planning attacks in the capital city of Bamako were arrested one day before the vote--cast a shadow over the runoff, although the number of polling stations that failed to open because of security reasons was significantly lower than during the first round; most of the shuttered stations were in the Timbuktu region, where jihadists killed the head of the election bureau in Arkodia, 100 kilometers southwest of the fabled city on the edge of the Sahara. Moreover, the foregone conclusion of the results of the second round given the lack of enthusiasm for the challenger, even among the political opposition, also seems to have depressed overall turnout even more than has historically been the case in Mali, where on average less than one-third of the voters have cast ballots in the second round of presidential elections. Nevertheless, observers like the Congolese-born former Italian Minister of Integration, Dr. Cécile Kyenge, who led the European Union's election monitoring team, noted that "all stations were staffed, the electoral material was sufficient, and ballot boxes were correctly sealed." With most analysts in agreement on the likely result of Sunday's poll, there are still two outstanding questions to be answered. First, what will the winner do with his new mandate? There is certainly no shortage of challenges. 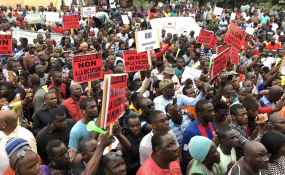 As the attempts by militants to disrupt the democratic process underscored, the security situation in Mali, especially the sparsely-populated northern expanses of the country, remains precarious. For four years in a row now, the 15,000-strong United Nations Multidimensional Integrated Stabilization Mission in Mali (MINUSMA) enjoys the rather dubious distinction of being the deadliest peacekeeping operation in the world. And the situation may be worsening as competition among extremist groups as well as intercommunal violence has led one civil society group to tally 932 attacks in just the first six months of this year. The insecurity in Mali has also spilled over the country's borders into neighboring Niger and Burkina Faso, adding a regional dimension that the G5 Sahel force, based in Sévaré in central Mali, is trying to contend with. Jumpstarting the stalled implementation of the agreement for peace and reconciliation that the government reached with the ethnic separatists in 2015 as part of the "Algiers process" should be a priority in the new presidential term; a solid effort would go a long way to dampen the fires of conflict in the north, especially among Kel Tamasheq (Tuareg) tribesmen who have rebelled four times since Mali's independence in 1960. More also needs to be done to foster dialogue between different communities, especially in the central part of the country that has witnessed much of the recent uptick in violence, as well as to improve governance on the subnational levels of Mali's regions and their constituent districts ("cercles"). IBK should have greater room for maneuver here since the constitution's limit of two presidential terms frees him to a certain extent from more pedestrian politicking. If the overall security situation can be improved, the government can focus more on its economic agenda. While Bamako is the fastest growing city in Africa (and the sixth-fastest in the world) and Mali booming economy that saw real GDP jump 5.5 percent last year in large part because of the country's emergence as the third-largest gold miner in Africa and the continent's top producer of cotton--rather extraordinary considering just six years ago the country was a failed state that had suffered a coup with two-thirds of its territory overrun by tribal separatists allied with jihadists. However, a rapidly increasing population means that these otherwise positive indicators are not enough. Mali still ranks 175th out of 188 countries and territories on the UN Human Development Index for 2017 and unemployment, especially among young people, represents a severe problem. Investment is needed, not only to create jobs, but also to diversify the economy which, alas, is too exposed to fluctuations in commodity prices. Second, while the international community's stake in Mali's success is pretty evident--in addition to the blue-helmeted MINUSMA force (one which Canadian armed forces officially launched their participation in just two weeks ago), the counterterrorism Operation Barkhane is France's largest overseas military deployment, with 4,500 personnel spread across Mali and its neighbors in the Sahel, to cite just one datum--how forthcoming will global partners be in delivering the resources needed, whether on a multilateral or a bilateral basis, to sustainably secure the progress achieved over past few years in Mali? One can only hope that they are, because the security of the Sahel and beyond depends on the strategic West African country's continued stabilization and improving prospects for the future.